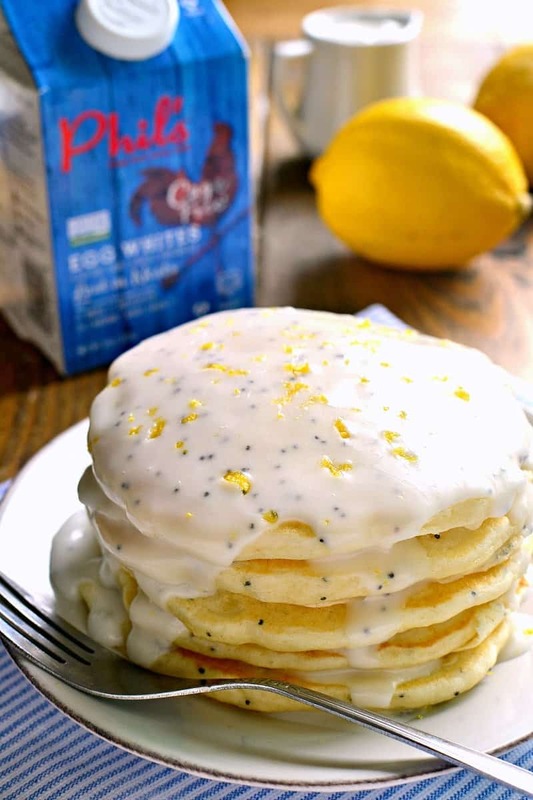 Lemon Poppy Seed Pancakes are light, fluffy, and bursting with lemon flavor! Easy breakfast pancakes to start your day off right. 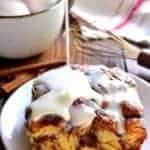 Try them with lemon poppy seed glaze for a sweet, tart, delicious start to your day. 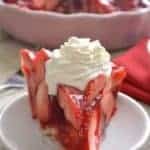 I partnered with Phil’s Fresh Eggs to bring you this recipe, but as always, all ideas and opinions are my own. One of the most fascinating things about getting married is suddenly realizing that not everything you grew up with is totally normal. HA! Not that you ever thought it was….but honestly, there are so many little things that Jorden’s family did differently than mine….and around the holidays, there always seem to be even more. Things like Christmas Eve traditions (my family usually went to midnight mass, Jorden’s family celebrated with a family night and tons of appetizers), whether or not we got Christmas stockings (no for me, yes for him), rules of present opening (in my family we all took turns, in Jorden’s family it was more of a free for all), and…..St. Nick! In my family, on the night of December 5th we would all get out our LONGEST sock and lay it out on the kitchen table….then wait for St. Nick to fill it while we slept. The next morning we would wake up to find fruit, nuts, candy, and little presents that had been left for us. It was like the first taste of Christmas – a little bonus – and always left us so excited for what was to come. Even though Jorden’s family didn’t celebrate St. Nick (Santa filled their stockings on Christmas) we decided to continue the St. Nick tradition for our kids. And….today was the special day! So, of course, our kids woke up out of their minds with excitement, not wanting to bother with getting dressed or eating breakfast or any of the usual things that happen on a weekday morning. Nope, they just rushed downstairs and ran straight to their stockings. The loot? New cozy slippers, shirts, snacks, and candy. And four gingerbread houses waiting to be decorated. I’ve always been a big believer that it’s all about the little things….and mornings like today make me feel it even more. The only thing that would have made this morning better? 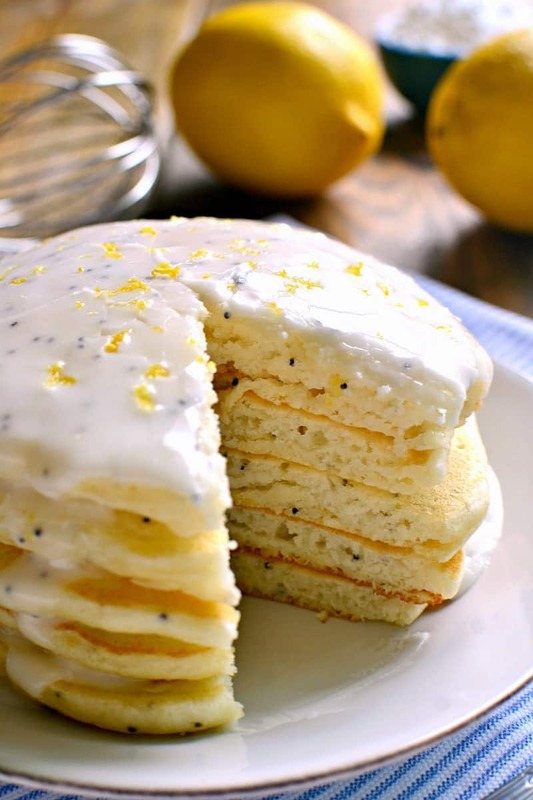 A big plate of these Lemon Poppy Seed Pancakes. Because, honestly, the ONLY thing better than waking up to a stack of homemade pancakes is waking up to presents. Am I right? 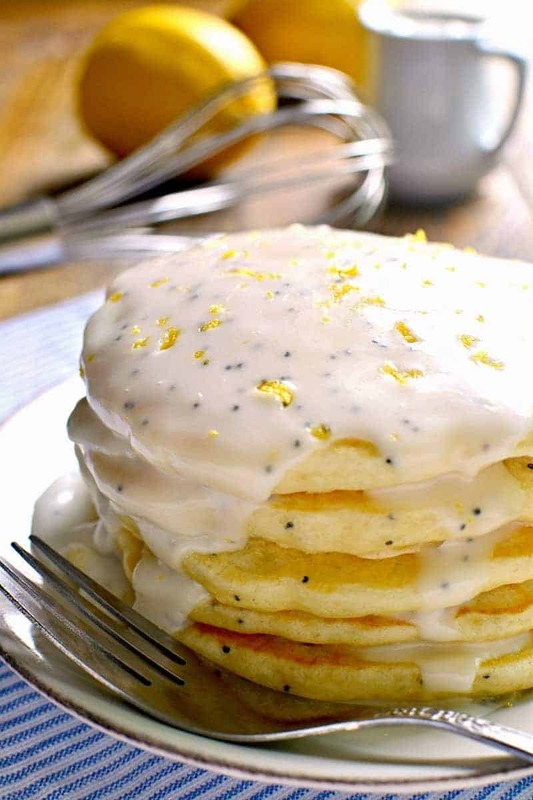 And these Lemon Poppy Seed Pancakes would have been the perfect addition. 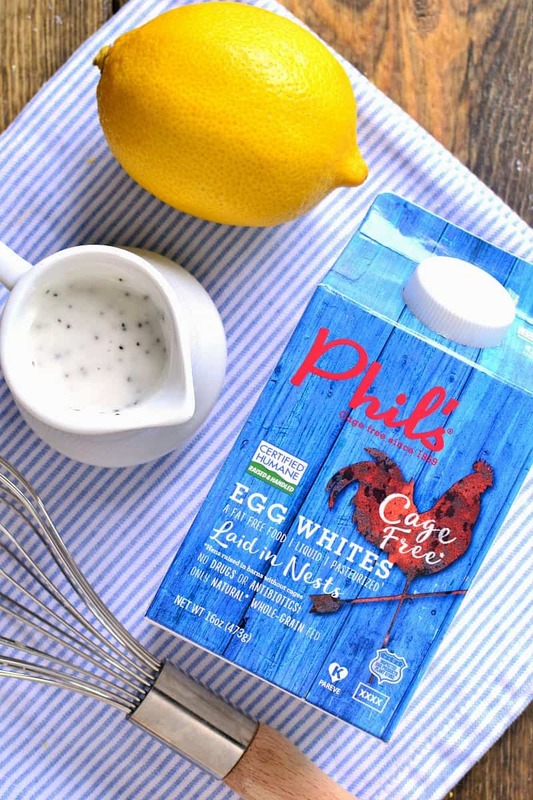 Made with lemon juice, lemon zest, poppy seeds, and Phil’s Fresh Egg Whites, these pancakes are light and fluffy and full of lemony goodness. And when you top them with a sweet lemon poppy seed glaze? Well, it might as well be Christmas morning! Or at least a very close second. 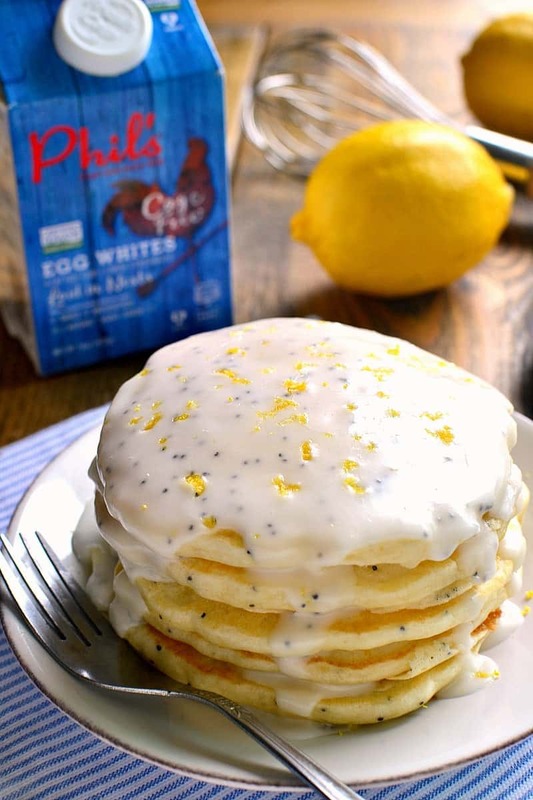 If you love these Lemon Poppy Seed Pancakes, be sure to check out the Phil’s Fresh Eggs website for lots more delicious recipes! In a large mixing bowl combine flour, granulated sugar, baking powder, and salt. 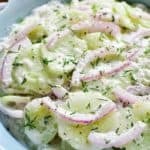 In a separate bowl, combine milk, oil, melted butter, lemon juice, poppy seeds, and lemon zest. Mix well; add all at once to flour mixture. Beat egg whites until soft peaks form; gently fold into batter. 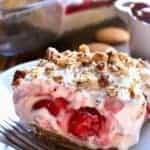 Let batter rest 5 minutes. Pour by 1/4 c. onto prepared skillet. Wait until bubbles form on the surface and pop; then flip pancakes until golden brown on both sides. For glaze, combine powdered sugar, lemon juice, and poppy seeds and mix until smooth. Pour over pancakes as desired. Try my Vanilla Green Tea Smoothie to go with your pancakes! 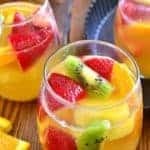 An easy smoothie to accompany your meal. I love that the lemon will lighten these right up! Pancakes are my favorite breakfast. 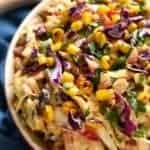 The addition of lemon and poppy seed are fantastic. 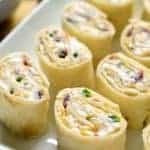 I’ve never made pancakes with egg whites – I can’t wait to give it a try! And that glaze! OMG. Holidays are so much fun gathering with family. Our traditions on each side are polar opposites which actually is fun for the kids since they see both. 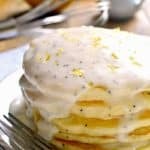 I absolutely LOVE the idea of fluffy lemon poppy seed pancakes! I’m wishing I was your neighbors so I could come over for pancakes, Cathy! 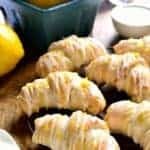 I’m a citrus fanatic and these look like lemon heaven! I love how fluffy they are, and that glaze! We are a Santa family but St. Nick sounds like so much fun to mix things up!! What great memories for your kids. Especially if you serve these pancakes for breakfast! I know what I’m making Chrismas morning!! These pancakes are a dream! I can’t believe I haven’t tried them before now! 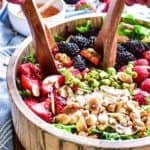 I confess I haven’t use poppyseed in my kitchen before but these make me want to! 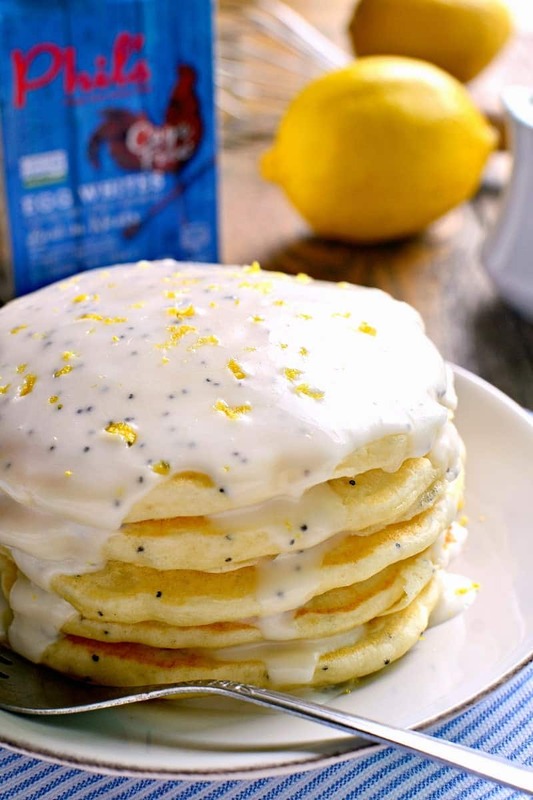 I love lemon poppy seed pancakes – these look so light and fluffy! John’s parents put up the tree Christmas Eve and “santa” decorated it when he dropped off the toys! 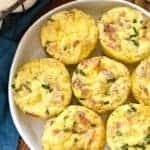 How many real eggs would you substitute in this recipe? how many regular egg whites to sub for 6 T of Phil’s?